Alain Vigneault has the 12th-most wins in NHL history. General manager Chuck Fletcher could have waited until some Stanley Cup playoff series were finished and talked to some of those teams’ assistants about the Flyers head-coaching job. That, he said, wasn’t necessary because he was enamored by Alain Vigneault’s resume and by the fact he felt a connection to him during the interview process. Vigneault’s track record -- he is tied for the 12th-most wins in NHL history, and eight of his last 12 teams had at least 100 points -- helped Fletcher make a quick decision. Great coaches can turn around teams quickly. For proof, see what Barry Trotz has done with the Islanders this season, transforming their defense from last to first in the NHL. In his first year with the Isles, Trotz directed the team to 23 more points (80 to 103) than before he arrived -- and he did it despite losing superstar John Tavares in free agency. Can Vigneault quickly revitalize the Flyers? Yes, his track record suggests. 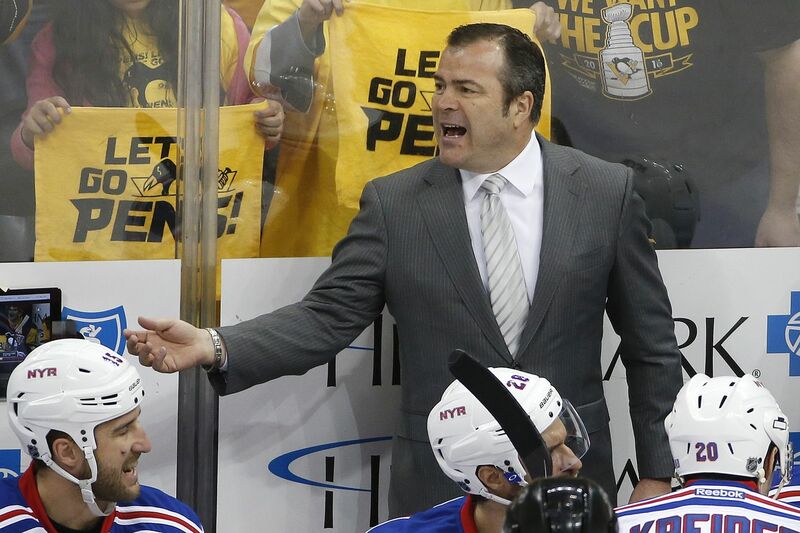 All three teams Alain Vigneault has coached have quickly turned around. The Quebec City native has a .588 career points percentage, and he has done well in his first coaching seasons with Montreal, Vancouver, and the New York Rangers, quickly getting his teams to buy into his system. In Vigneault’s first season with Montreal in 1997-98, the Canadiens made a 10-point improvement over their previous year and reached the conference semifinals. In 2006-07, his first season in Vancouver, the Canucks made a 13-point improvement, accumulated 105 points, and finished first in their division before losing in the conference semis. Six of his seven Vancouver teams won division titles. Vigneault’s first-year success with a new team continued in New York in 2013-14, when he directed the Rangers to a 45-31-6 record and just their third Stanley Cup Finals appearance since 1980. Known as “AV,” Vigneault is in a good position to turn around his latest team. The Flyers, plagued by another slow start and by goaltender injuries, finished this season with just a 37-37-8 record. But Fletcher has lots of cap space to make improvements, and he is likely to add a second-line center -- free agents include Kevin Hayes, who played for Vigneault with the Rangers, Matt Duchene, and Brock Nelson -- and a top-pairing defenseman. Winnipeg defenseman Jacob Trouba, who can become a restricted free agent, is expected to be available in a trade and he would fit nicely alongside Ivan Provorov. Fletcher also must find a backup goalie and perhaps a winger. Winger Artemi Panarin is an unrestricted free agent, but he could be reunited with Joel Quenneville, his former Chicago coach, in Florida. Other productive wingers who can become unrestricted free agents July 1: Jeff Skinner, Anders Lee, Gustav Nyquist, and Jordan Eberle. It’s a roster the new coach will like even more if Fletcher adds the much-needed missing pieces.